After a career in PR and journalism, Victoria Hislop published her first novel The Island in her mid-forties. A multi-generational saga set against the backdrop of the Spinalonga leper colony in Crete, The Island was by any measure, a publishing sensation. Her new novel The Thread is a romantic saga entwined with the turbulent 20th century history of Thessaloniki, and continues to reflect a love affair with Greece, that is as deep and passionate as that felt by any non-Greek author writing today. “Yes, the truth is, I think I’m obsessed with Greece,” says Victoria, who I’ve managed to catch before she heads to Athens from London for the Greek launch of The Thread. Today Greece is Victoria’s second home. She owns a family house on Crete (near Aghios Nikalaos) and speaks Greek fluently. Her three-week tour of Greek cities will promote the new novel and its launch in Thessaloniki will be the most poignant. The Thread is a tribute to that city and its citizens, and their desperate story that unravelled in the first half of the last century. The new book is Hislop’s most ambitious to date. In both its historical scope and in terms of its small ‘p’ political, as well as romantic narrative, it interweaves the lives of its characters into the backcloth of Greek history over three generations. The Thread touches on deep and sensitive themes: the effects of the Asia Minor ‘Catastrophe’, anti-Semitism and the Civil War. As in The Island, Hislop partly tells the story through the voice of the family today, travelling through time, connecting the past with the present. In the first chapters of The Thread the reader is transported to Thessaloniki harbour in May 1923. A teeming mass of Greek refugees from Turkey pours from a ship, newly swapped for Greece’s Muslim population. It is a scene of one of the most painful exchanges of peoples ever conceived. Among them is five-year-old Katerina Sarafoglou. Separated from her mother in their flight from Smyrna, Katerina is adopted by Eugenia, another refugee. When they are allocated a new home, Dimitri Komninos, the son of a rich, authoritarian merchant, is among their neighbours. The eventual relationship between seamstress Katerina and Dimitri forms the backbone of The Thread. Beside the lovers’ narrative, the tortuous story of Thessaloniki is drawn out through the experience of the two families and their friends – Christian, Jewish, and Muslim. “It is a homage to the city,” says Hislop, who first visited Thessaloniki five years ago when she was invited by the university to talk about The Island. Reading about the population exchange convinced the author that the subject would be the starting point for a new novel. “I hadn’t realised what a huge impact this exchange had on Greece. 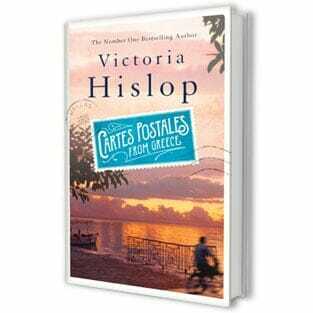 I thought if I didn’t know about this, then most who read my books also don’t know.” One of Hislop’s favourite pastimes on her visits to the city was to sit in a Niki street cafe and look across the water to Mount Olympus. It was here that the two main characters in The Thread first appeared to her. Given the success of The Island and To Nisi, and the added dimension and scope of The Thread, the new novel promises to elevate Hislop further as an internationally acclaimed author. Her storytelling, as has been proved by the remarkable To Nisi production, can also be transferred to the screen with huge commercial potential. Hislop was recently approached by a large British film company who wished to make the The Island into a major feature film. But the discerning author isn’t about to agree to just any invitation, however financially appealing. Talking about The Thread, Victoria says that although she consciously avoided reflecting on Greece’s current crisis and its repercussions, the story nevertheless has some underlying connections. “I hope people will read it and think ‘gosh this tiny country has had a very rough time, and very often it’s not the fault of the people’. “There is a link with now, a kind of a continuum of catastrophe that leads right up to the present day.” One thing is clear when talking to Victoria: her passion and empathy for Greece is not something shallow and cosmetic, and far from a commercial convenience. Horrified to hear that Greek schools’ budgets had been so severely cut, that there was no budget this term for books, Victoria is doing something about it. “I had emails from teachers in schools, people I’d probably met at signings saying we’ve come back to school and the kids just have a notebook. To me it’s like hearing they’re not eating properly, they’re being mentally starved,” says Victoria. As well as donating her own works, she has now embarked on a campaign to persuade fellow authors who are being published in Greek, and their publishers, to donate quantities of their books directly to the schools. “I’ve got two other British writers on board so far,” says Victoria, “Giles Milton, who wrote the very successful book on Smyrna Paradise Lost, and Anthony Horowitz, the children’s novelist. They too are very fond of Greece.” “I don’t know where it’s going to go at the moment, it’s just in the early stages. I’d like it to snowball, I really want to do something, and this is an area where maybe I can help.” Plainly, Victoria Hislop’s actions speak as loudly as her words.